Sarah Woodruff, on death row in Oregon for murdering her lover, John Finley, has appealed her case to the Supreme Court just when a prominent justice resigns, leaving a vacancy. Then, for no apparent reason, another justice is mysteriously attacked. Dana Cutler—one of the heroes from Margolin's bestselling Executive Privilege—is quietly called in to investigate. She looks for links between the Woodruff appeal and the ominous incidents in the justices' chambers, which eventually lead her to a shoot-out that took place years ago on a small freighter docked upriver in Shelby, Oregon, containing a dead crew and illegal drugs. The only survivor on board? John Finley. With the help of Brad Miller and Keith Evans, Dana uncovers a plot by a rogue element in the American intelligence community involving the president's nominee to the Supreme Court, and soon the trio is thrown back into the grips of a deadly, executive danger. 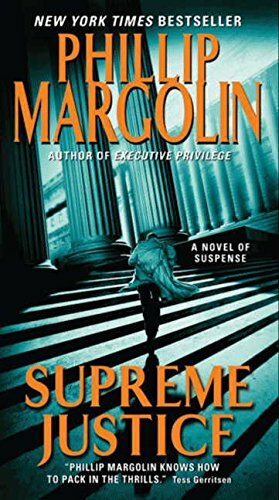 With nonstop action, Supreme Justice picks up where Executive Privilege left off, putting readers right back where they were—on the edge of their seats.